Seagrove pottery by Dan Triece of Dirtworks Pottery. Dirtworks has been in business since 1987 and is located in the heart of Seagrove, North Carolina, "the pottery capital of the Southeast." 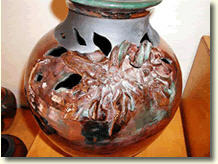 The exhibit will include functional stoneware pieces as well as decorative, raku-fired ceramics. Fiber art show by local artist, Ali Givens. Ali creates her bold, playful quilts by layering and stitching brightly colored batiks, linen, and silk. She gets her inspiration from both island and big city life. Join us for an artist reception and enjoy complimentary refreshments during the 2nd Friday Artwalk. Friday September 13, 6-9pm.